SAINT PETER, Minn. – The Gustavus Student-Athlete Advisory Committee (SAAC) hosted a Special Olympics flag football event Sunday with 68 athletes, 35 Unified Partners, and 20 coaches at Hollingsworth Field. 2018 marks 50 years of Special Olympics and in honor of the milestone, the Division III National SAAC has initiated a 50 for 50th challenge. 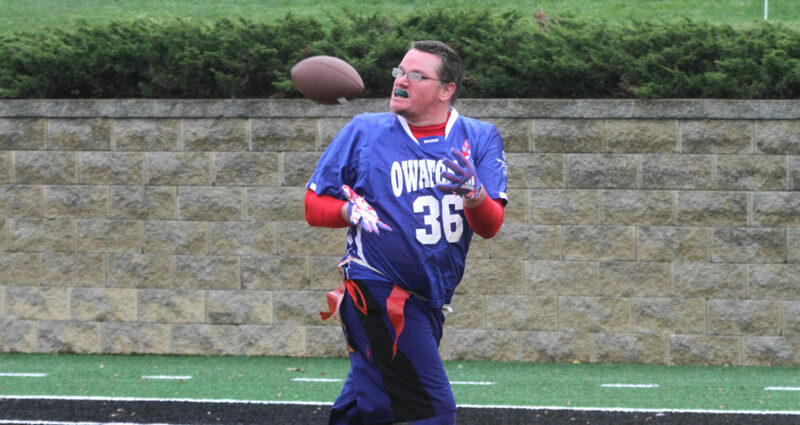 Each Division III institution is challenged to have at least 50 student-athletes participate in a Special Olympics event by the end of February. The three institutions with the highest percentage of student-athlete participation will face off in the March 2019 Special Olympics Spotlight Poll. The institution with the most votes in the Spotlight Poll will be announced during the 2019 Division III Week and receive a special grand prize. Sunday’s flag football event had 102 Gustavus student-athlete volunteers. Upcoming Special Olympic events at Gustavus are swimming and basketball on Sunday, April 28, and track & field on Sunday, May 5.